Red River Real Estate and Vacation Rentals - Ski View Condo 4, Red River, New Mexico. Ski View Condominiums are so well known amongst people who love coming to Red River for their vacation! These have so much to offer such as great views, the massive community deck allowing guests the perfect place to relax and enjoy the amazing weather Red River has to offer. Use the Ski Views community gas BBQ grills(Gas Cylinder provided, courtesy of Red River Real Estate) to show off your grill skills! The Ski View Condo’s are right off Main Street making them perfect for any guests to wanting to walk through the town stopping at the many stores and restaurants. 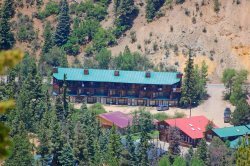 You are even in easy walking distance to the Ski and Summer Area. Enjoy the commons area that is provided by the Ski View Condo’s, a great place for anyone wanting to get away and watch some TV, play games, or even do laundry with the coin operated washer/dryer that is able to be used by all Ski View guests. Even though these units are Condo’s, step through the front doors and be amazed with how roomy this units truly are! They are so spacious that it is a better choice than a lodge or a hotel! Ski View Condo 4 is a spacious two bedroom, two bathroom that is on the main level of the Ski Views. Step into the front door and immediately notice the open living room, dining area and kitchen. Play games with family and friends, or relax while flipping channels on the flat screen TV and DVD player giving the guests the option of watching satellite or movies brought from home! The Ski Views also provide free WiFi for guests to use during their stay! In the living room you have two sofas that can be pulled out to queen sleepers, but still have plenty of room to be able to navigate easily through the whole living room. Ski View Condo 4 has just recently been updated with new counter tops in the kitchen giving plenty of counter space. One of the best things about these units is that the kitchen is open so anyone cooking will never be out of the action with friends and family! When walking back to the hallway you will find both bathrooms. One on the left and one to the right. After the bathrooms there are two bedrooms. Each bedroom is equipped with queen beds. These condos are truly one of Red River’s most lovable places. Want a vacation home that has it all? Stay here and fall in love with the Ski Views like many before! Two queen beds, two queen sleepers. Commons area that has a foosball table, shuffle board, a ping pong table, and a coin-operated washer/dryer. An outside commons area with gas BBQ grills. Ski View Condo 4 provides satellite and free WiFi. Ski View Condo 4 pet policy: Sorry no pets! Very friendly and helpful. I especially liked the text communication. Appreciated the text messages before, during, and after our stay. Outstanding stay! This is our 3rd time to stay at Ski View. We will continue to stay at Ski View every trip to Red River. We didn't really have much interaction with the team, which speaks volumes on the efficiency of how they work, 5 minutes or less to check in and even less when we checked out. Property was really nice and it's location was great for us. Those who are looking to be in the center of everything may be disappointed, but we were looking for quiet with a view and that's exactly what we got. The condo was very spacious and modern. Excellent place to stay with the family. This was our third time to stay in Ski View #4, and we plan on returning in the future. Accessibility to Red River shopping and the ski resort is easy. Red River is a great family destination!